The study tour section of the trip started in earnest at half eight on Tuesday morning after our dishevelled group staggered down from breakfast, such as it was. I was worried that I wouldn’t know many people or that travelling in a big group wouldn’t suit me (it didn’t totally in Barcelona and that group was smaller) but I needn’t have worried. Ellen my roommate and first-aider was not my only companion after her return from saving baby rhinos in South Africa. Grace and Conor from my university were there as well. And everyone else was lovely and we all got on so well that I felt silly I’d ever doubted. Hotel Oscar, beside Larissa train station, was clean and had a nice swimming pool which was pretty much all you could say for it. The rooms were small, the lights in the lifts turned off periodically and the breakfast was as near to inedible as makes no odds. The “boiling” water to make tea was barely warm. 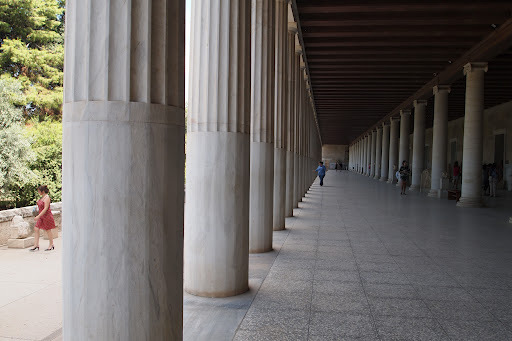 But despite all this we started off mostly on time and began in the Athenian Agora. The agora was so much more than a marketplace. It was the commercial, civic and social heart of the city with huge religious significance too. Government buildings, temples, the prison and shops were all to be found here. Roofed, columned streets called stoas that had once dominated the site would have provided welcome relief as we baked into the dust. 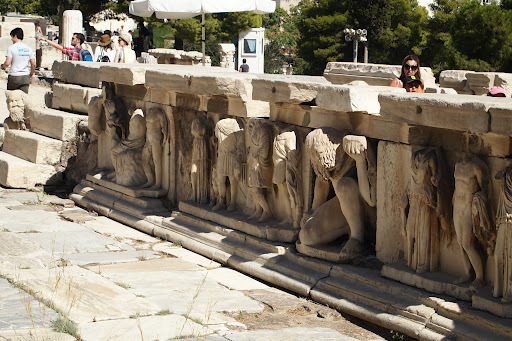 They rebuilt one of the stoas, known as the Stoa of Attalos, a Hellenistic king of Pergamon, who had it built. The second you walk inside you can tell why they built them. It was so much cooler and more comfortable. They even built the museum in it where the shops would have been to house the artefacts recovered from the site. The Stoa of Zeus was not rebuilt but it’s interesting, over on the west side of the agora. 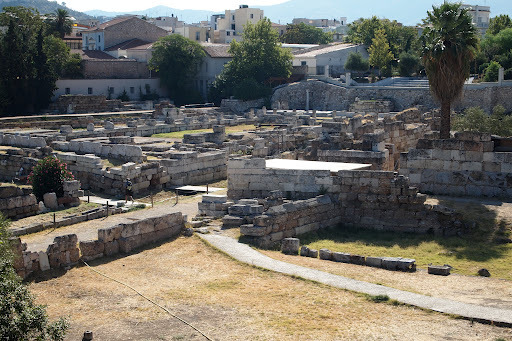 According to written accounts this stoa was often full of jugglers and performers as well as philosophers. Plato spoke here and it is possibly where Socrates was arrested for heresy and corrupting the youth of Athens. 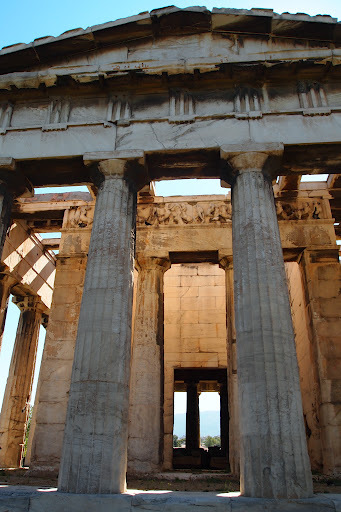 Up the hill is the Hephaistion, the best preserved Greek temple in the world. This was when we lost the first of our numbers to heat stroke. The sun did beat down on the stone in an unreasonably harsh way and the wind just seemed to move the heat around by this point while flicking hot dust at you. We crossed to the south agora where they think the state prison was and if so then where Socrates died. 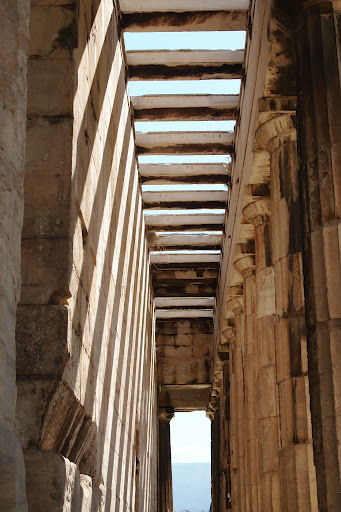 The Bouleuterion, the building where the Boule or Assembly, all eligible Greek citizens, could vote on motions and law, as well as the Tholos where the executive elected committee of government drafted the laws that would be voted on. Being there really made you marvel in what they had. 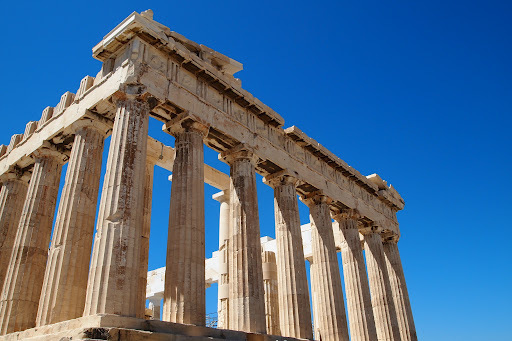 Scholars romanticised and exaggerated Classical Greece’s less than perfect system for so long that this generation of academics are a bit apologetic, bringing up all the slaves, woman and aliens who were excluded. All that is of course true and it was hardly a democracy in the modern sense but I can still be impressed at how close it was two and a half thousand years ago. The ideals of democracy and fair political systems are as much an issue now as they ever were. Next we walked up to the Acropolis. I wasn’t going to be caught out be the breeze this time and wore shorts under my dress. I definitely learned more the second time around about the smaller temples in particular. I wish it was possible to access the caves on the north slope of the hill, sacred to Zeus and Pan. I love a good sacred cave. I remember the massive cavern system I visited in Crete that claimed to be the birthplace of Zeus. That’s a common claim in Greece but if anywhere really was I think it was there. 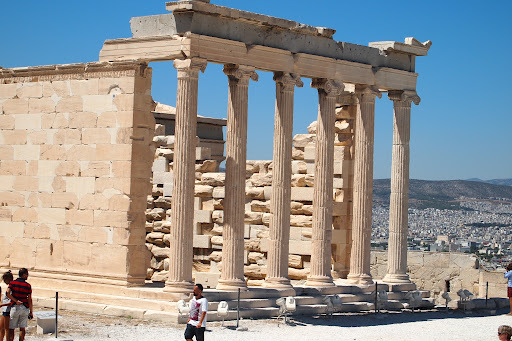 The Parthenon had lost none of its grandeur but this time I noticed the majesty of the propylon (entrance way) of the Acropolis and the Erechtheion, a smaller temple sacred to quite a few deities including Poseidon. This, myth held it, was the spot where Athena and Poseidon competed for the Athenians to chose who would be patron of the city, Poseidon thrust his trident against the rock and salt water poured forth. Athena offered the olive tree and she was chosen. But the spot where the water is said to have flowed was still considered a holy site. We came down the south slope of the Acropolis passed the Roman theatre of Herodes Atticus who I told you about before. Behind that is the Sanctuary of the Nymph, one of the oldest Sanctuaries on the hill. 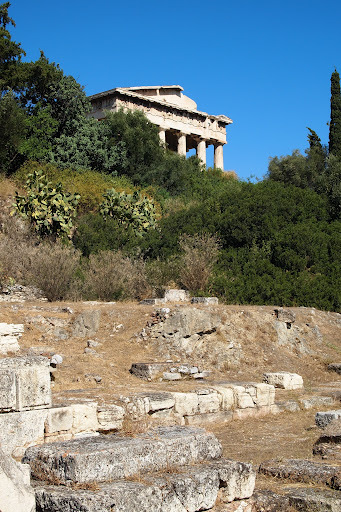 Then there was the Asklepion, the sanctuary of the healing god. 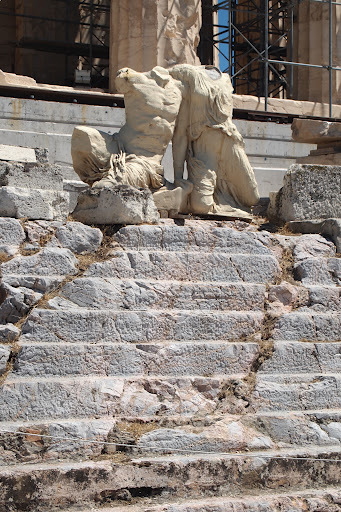 Then we passed by the Theatre of Dionysus again where I was still struck by its age and importance. I wanted to remember so Euripides or Aeschylus for the occasion but my memory wasn’t good enough. I’m sure someone in the party would managed it for me.